I am an Elementary Art teacher who has begun selling her own artwork on the side. As I said, I did work some more on the cherry blossom painting I am working on for my friend. I am liking it better now, but it is still not finished. Hopefully in the next couple of days I will get it finished. 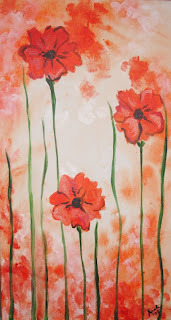 I did complete and post two new paintings for my shop today, another Abstract Poppies painting like some others I have done and a very cheery Orange Poppy painting. 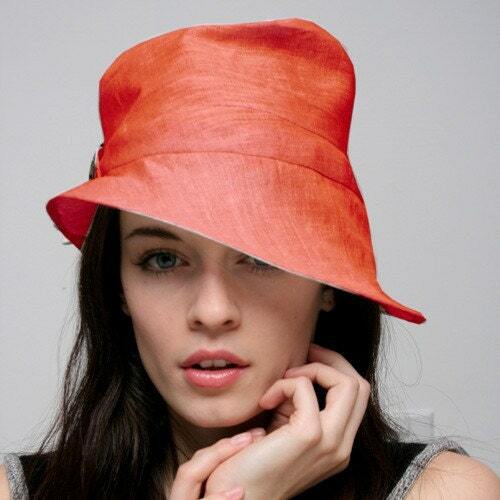 I just love orange! It makes me smile. Don't you just love those wonderful, lazy, Saturday mornings drinking your coffee at a relaxing pace while contemplating what to do with your day? I'm so happy to say I don't have any real plans today, I can do whatever I feel like. Well, I do need to get dog food today or else my puppies won't be happy with me. I think, truly, finally I will try to finish a cherry blossom painting I'm doing for a best friend of mine. I started a couple of weeks ago, but wasn't liking the direction it was going, so I'm starting over. Luckily, I'm doing it as a gift so there's no real rush. Have a great day! I just had good friend buy a piece of work from me on Etsy, very cool! The best part is that I can just take it to her, no need to wrap and ship! Thanks Brandi! Can't wait to sleep in tomorrow! I love these purses!!! They are made from seller moxieandoliver on etsy.com. 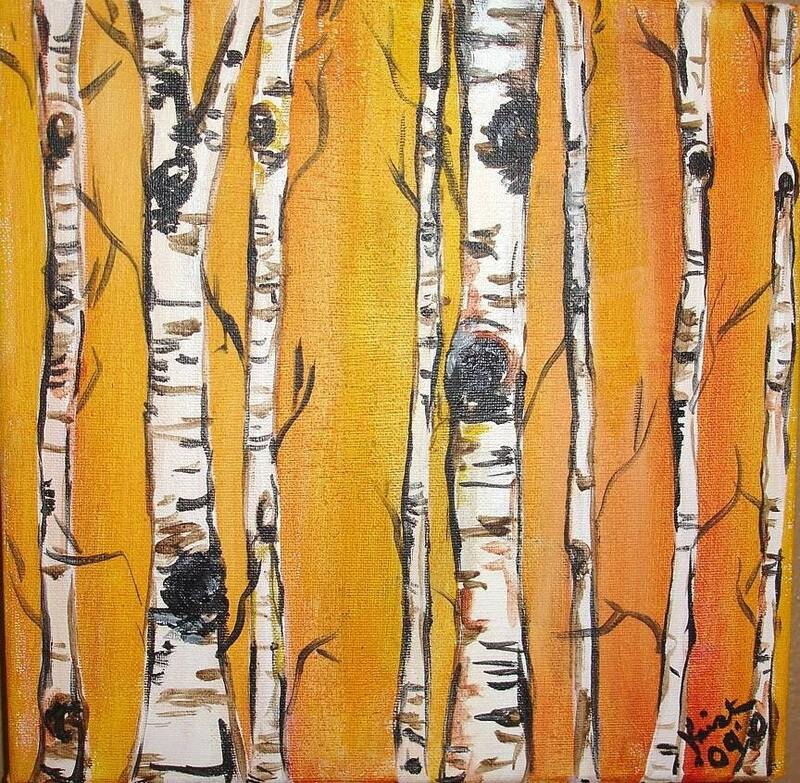 I think I am going to need to buy one after a couple more paintings sell! Here's a great recipe I found and tried today, you would never even know it's low carb, delicious! Blend all together in a blender, delicious and guilt free! 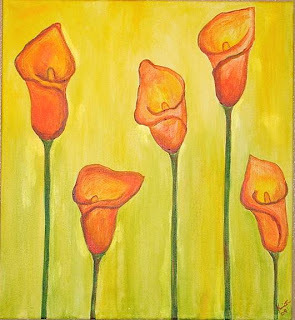 Orange Calla Lillies on yellow-green background sized 22"x 24" on 3/4" gallery wrapped canvas. 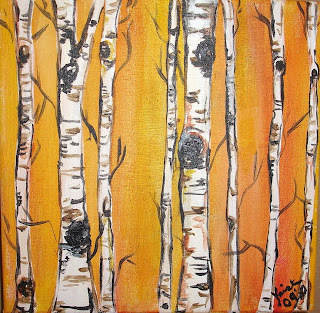 Large Birch Trees on a golden brown background with real texture! I sold my first painting to someone outside the U.S.today. 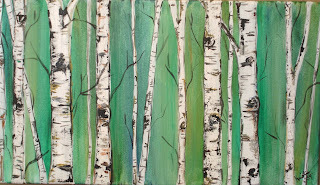 My Birch Trees are going to Canada! Now I think I will begin working on the Cherry Blossoms painting I promised to my good friend. I am going to her house tonight, I wonder if I can get it done in time! 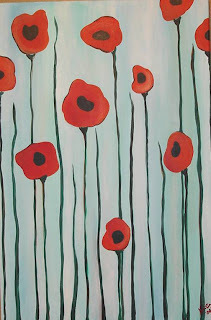 I just got done posting two abstract poppy paintings I got a commission for each is sized 24"x 36". I like the two together I think they are an interesting pair! "Orange you glad you looked at me?" It's Saturday, I am not going to be painting today, I too many other things to do! That's ok though. I am going to an open house at a shop in town where I sell my paintings. The shop is so very cute, but it has not gotten much business since it opened last summer, hope this helps today. Later I am going to my nieces birthday party, she is 6! And if the weather holds up I might go hang with friends at the taste of Fort Collins later. Hope you all have a wonderful Saturday!!! My first post in a treasury on Etsy!!! I got my first item entered into a treasury on Etsy yeah!!! Thanks Andrea. Check it out!!! Visit my shop, everything on sale with free shipping!!! I hope to add two more triptychs in my shop today too. 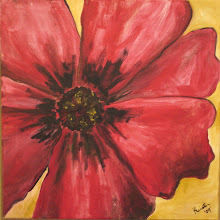 One of big, red poppies that's almost done, and another sunflower triptych like the one I did earlier this week! My friend came over today and decided she wanted me to paint her some cherry blossoms for her kitchens, I have never painted cherry blossoms before, so that should be fun. I have sold two triptychs this week so I'm going to go with it. I just stretched and gessoed canvases to make three more. I'm going to try and get two of them done tomorrow. I want them done for the weekend, I have my Yart Sale in my shop and I have a featured spot in the painting section on Saturday. I going out for mexican and $.99 Margaritas tonight...Yeah! Have a great evening. 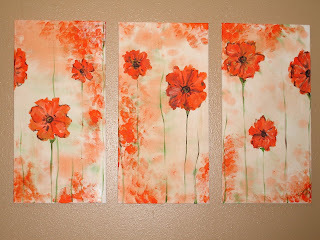 Orange Poppy Tryptic Sold on Etsy! 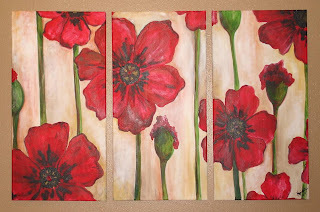 Yeah, I just sold my Orange Poppies Triptych in my Etsy shop this morning! What a great way to start the day. 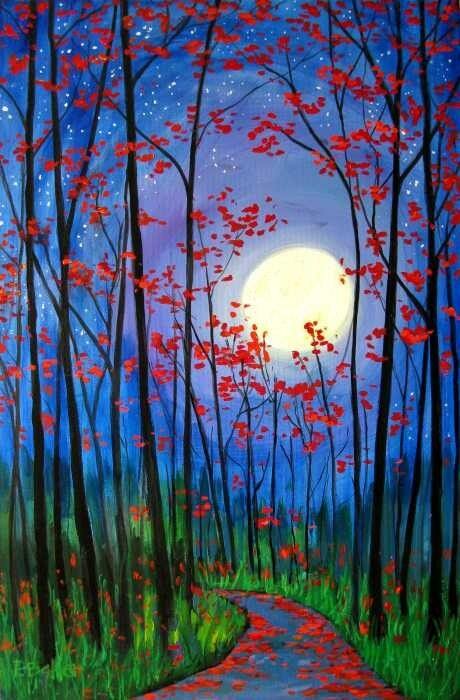 Today I have one of my best friends coming over, I am doing a large painting for her house, great free advertising! She hasn't decided what she wants yet so we're going to look at some past paintings to get some ideas. Check out my Yart Sale through Sunday, Everything in my shop is on sale with free shipping!!! Yay, I got my lawn mowed before the storm! I can believe the weather here this summer. I don't ever remembering getting this much rain in a year. It's good for my plants and yard though. 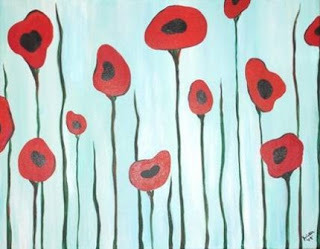 One is called "Abstract Red Poppies". I have some of my paintings for sale in a small shop downtown and these have done well there. 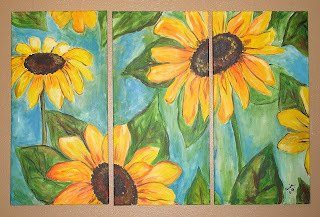 The first one I ever painted was last summer and it still hangs in my bathroom. I have become attached to it! Again, I have a Yart Sale going on in my shop where EVERYTHING is on sale and custom paintings and pet portraits are 10% off. Sale goes through Sunday-Check it out! Have a fabulous day, talk at ya soon! Wow, I need to mow my lawn! 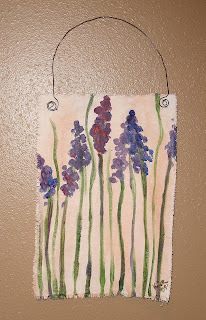 I have been so darn busy painting, working on my shop, etc. My household chores are getting out of hand! It has rained so much here in Northern CO lately, my grass is growing at alarming speeds! 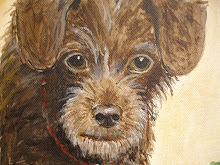 If I don't mow soon, I'll never find my little dog again :0) I will get back to painting later. Check out my Yart Sale on Etsy! Everything in my shop is on sale and all custom paintings and pet portraits are 10% off through Sunday! Done for the Day, I'm Tired! Yeah, I got one more painting done and posted on Etsy! 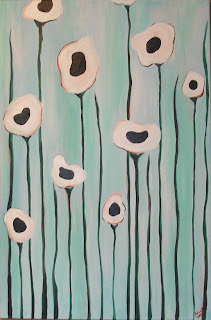 I took my abstract poppies one step farther with this one. I'm interested to see how many hits it will get, it is pretty different from most of the things in my shop. I'll be doing more tomorrow, but now I am going to relax! I completed this commission today for a customer on Etsy.com. I'm very happy with the way it turned out! I might have to paint one for myself sometime! I am going to try and get another painting done today to post hopefully. Time to get to work, I feel like the days pass so quickly when I am painting and working on my business! I love it though. 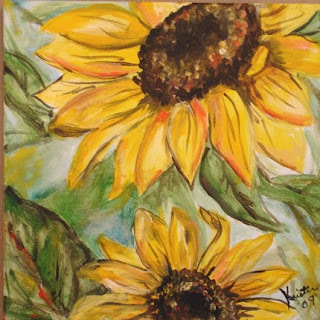 It is supposed to be another rainy day here in Windsor, CO, so a good day to paint! I am excited about what I am painting today. 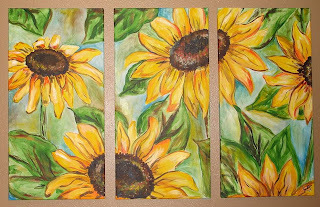 I am creating a sunflower tryptic for a customer and I am going to experiment with some mini pet portraits (4x6in). 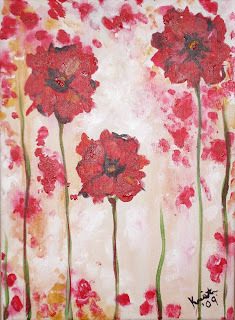 I posted a mini painting yesterday of Red Poppies, we'll see the results of that :0) Off I go! I just got a commission on Etsy, it's my 3rd in 2 weeks on the website, I'm so excited! I hope this keeps up! I think today I am going to try something new with my paintings. I am going to try and do some very small paintings, something I have never done before and see how well they do in my shop. Why not, it's always fun to try new things and see how people respond to them! I am looking for fellow Etsy sellers who have advise on how to be successful on Etsy! 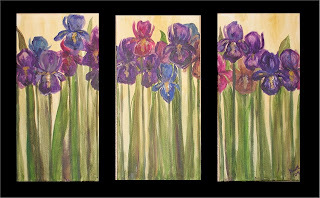 Starting at $85.00 for 11x 14"
Field of Iris Triptych 24"x 36"
I teach Elementary Art as my day job and paint in my free time. It is my dream to someday support myself solely with my art. But for know it is a fun and fulfilling creative outlet I do on the side. I am a crazy dog lady with three dogs running around my house. Two little chihuahua mixes named Lucy and Linnie and a German Wire haired Pointer named Layla. I hope you enjoy my blog!